Interview coming up? 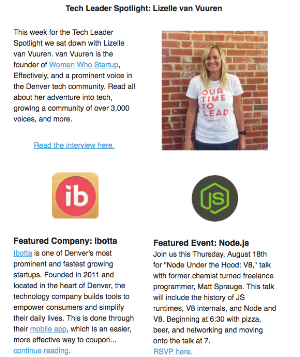 Check out our insider tips for getting a job in the Denver Tech Scene here. Keep up with all the local happenings, companies and entrepreneurs. Connect with like-minded individuals to improve your projects, ask questions, and give advice. Aspiring developer? Check out these Denver schools to begin your journey or advance your skills. Need a space to start your company, hold a meeting, or finish that project? We've got you covered. Whether you're curious about a topic or a seasoned expert, meetups are a great way to meet people, learn new skills, and find new passions.